PocketBook Touch HD provides excellent optical properties due to its 300DPI E Ink Carta™ 6-inch touch-screen, and gives convenient opportunities to listen to audio-files. 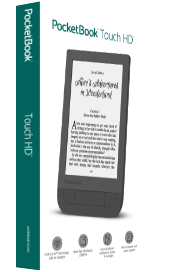 PocketBook Touch HD made in best PocketBook traditions provides wide opportunities with touch-screen, built-in wireless Wi-Fi, frontlight, preinstalled dictionaries, more than 30 languages of interface localization and support of 22 formats not to mention mp3. To store user’s digital library and audio-collection the new e-reader is equipped with 8 GB of internal memory and external microSD card slot (up to 32 GB). An efficient processor of 1GHz and 512MB RAM provide fast response and stable work of any application and smooth turning of pages. The user of PocketBook Touch HD may select content in any format – the device supports without converting 18 popular text and 4 graphic formats (JPEG, BMP, PNG, TIFF). The preinstalled Abbyy Lingvo® dictionaries (21 translation directions) are essential for foreign books reading. Built-in wireless Wi-Fi together with Dropbox, Send-to-PocketBook and PocketBook Sync services will allow to deliver any e-content on the device fast and easy, without having connection with PC. There is a pleasant surprise for those who like to read and listen to music at the same time. PocketBook Touch HD received all needed features for audio playback. The e-reader supports mp3 format and have standard 3,5mm audio jack. The user may download the collection of favorite music to the device and combine reading with music. The same features give opportunity to listen to audio-books. A user have alternative now – to read a book or to enjoy professionally recorded audio-book in mp3 format. Another one valuable characteristic – PocketBook Touch HD have Text-to-speech function, which converts text into spoken voice output. It means the e-reader may read aloud any book or document in any text format.